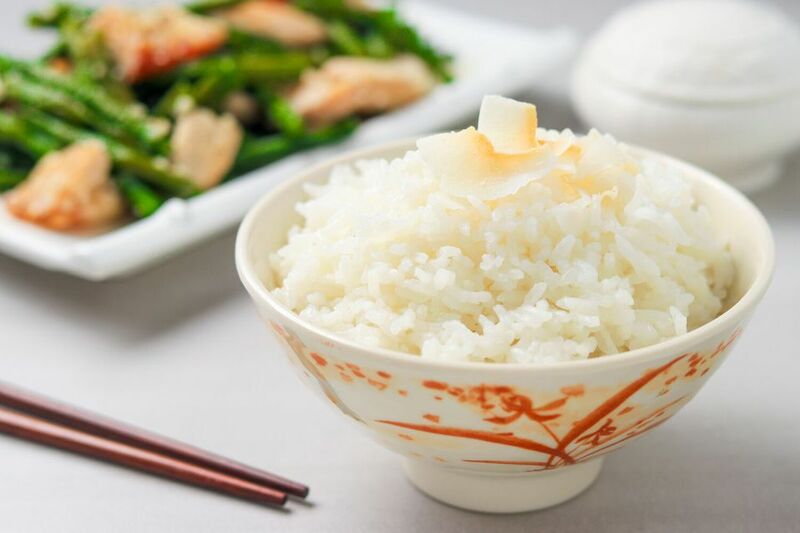 Coconut rice makes a deliciously easy side dish that can be served with a variety of Thai and Indian dishes such as curries, stir-fried vegetables, fish, and seafood mains. This easy coconut rice recipe is made in a rice cooker. All you need is rice, coconut milk, salt, and dry shredded coconut, and you'll be serving up some delicious coconut rice in just 20 minutes. Place rice in rice cooker. Add the water, coconut milk, salt, and shredded coconut. Stir well; use a plastic or wooden utensil to avoid scraping off the non-stick surface. Cover and set to cook. Once your rice cooker switches to "warm" mode, allow another 8 to 10 minutes for the rice to finish steaming. This will ensure your coconut rice is fully cooked and pleasantly sticky. Gently fluff with chopsticks before serving. Some of the shredded coconuts may have risen to the surface; just stir it back into the rice. Taste-test it for salt, adding a little more until the desired flavor is achieved. Serve with Thai, Chinese, or Indian dishes of your choice. This pairs well with Thai curry recipes, Thai fish and seafood recipes, and vegetarian Thai food recipes. Rinse the rice. Some rice is coated with talc in processing. This material is inert and won't hurt you if you ingest it, but we'd prefer to have just rice in our side dishes. Rinsing also helps keep the grains separate as they cook, as well as helps to remove starch, which makes it less mushy when cooked. If the rice is still hard, add 1/4 cup of water and cook it, lid on, on very low heat for 5 more minutes.